Showing Eros Daniel in Gray. Keth Mommsen takes her time before releasing new stuff! She wants things to be their best. So it’s always a pleasure to try on new stuff from her! This suave shirt and leather pants are worth the wait. The shirt shows a nice pattern, and it’s fully tintable, so you can modify it to suit your most crazy color needs. For those who are dye allergic, Keth offers a pre-tinted shirt pack. You will have a tucked and untucked version of the shirt (jacket and shirt layer) plus complement on the underpants layer. 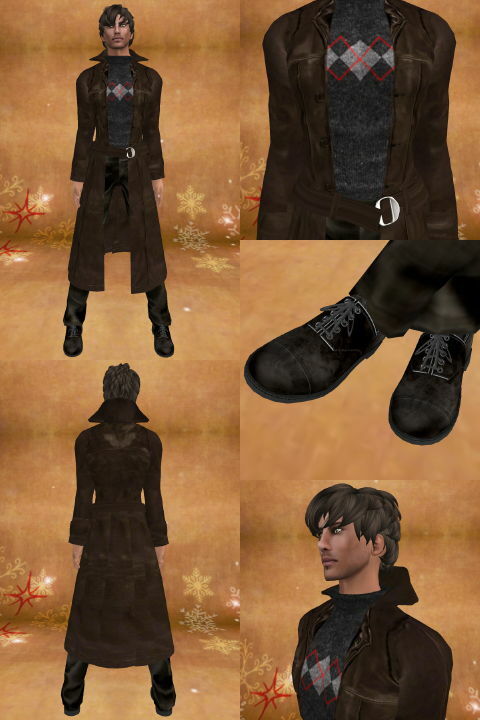 Pants come with two versions, one with decorated back pocket, and three pre-sized prim cuffs. They are nicely textured, and complete perfectly with sobriety the Suave Shirts! Everything is moddable and transfer. I miss a copy-no trans option, especially considering the tintable feature. You can get a pack including a shirt in the color of your choice (and tintable), the pants and their accessories for 300 Lindens. Pants alone are sold for 150 lindens. You can choose one of the two packs of 6 pre-tinted shirts for 600 lindens, in two versions: dark and light colors, with each time a white tintable version.